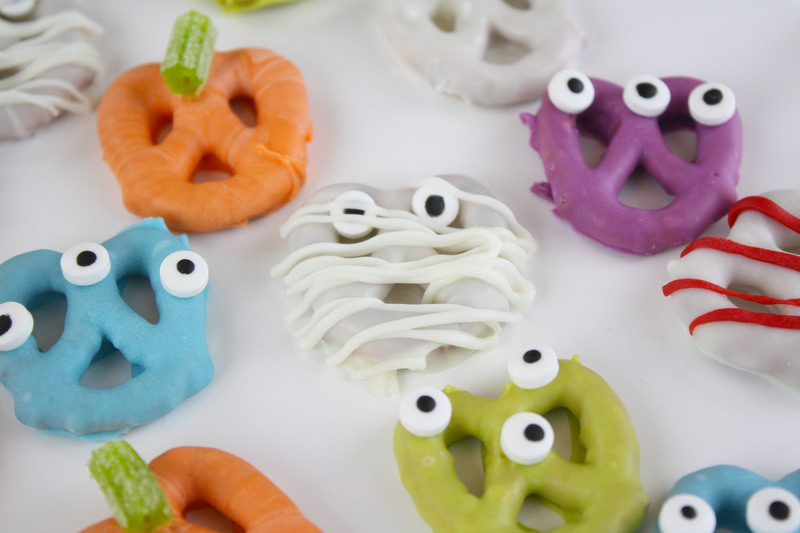 I'm absolutely loving these adorable Halloween pretzels! 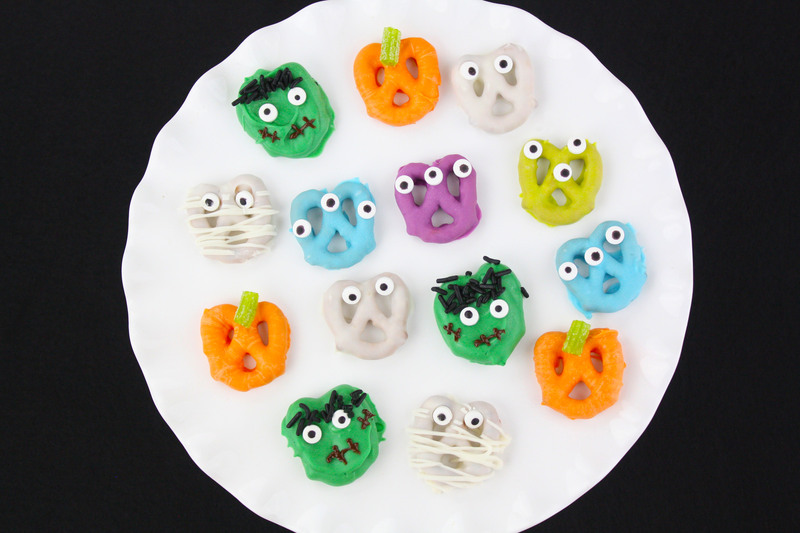 There are mummies, monsters, pumpkins, and Frankensteins! 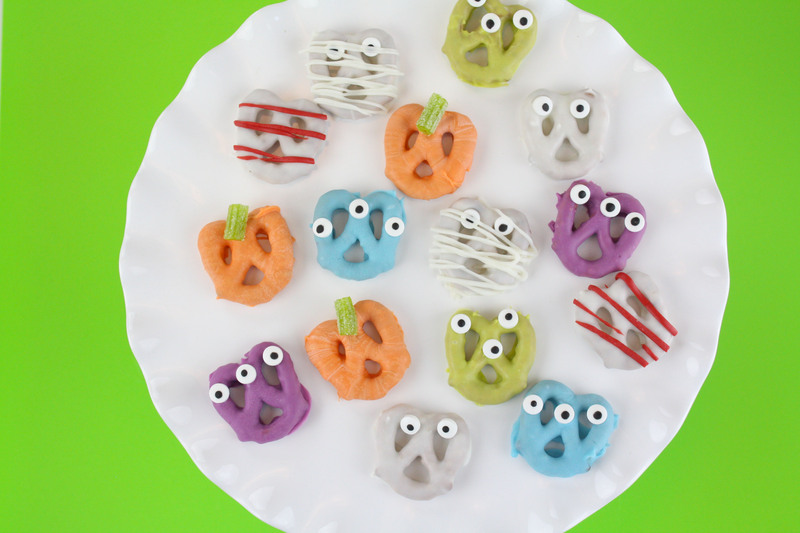 This is a perfect food craft to do with your kids. Here's how we did it! Melt the green candy melts according to package instructions. 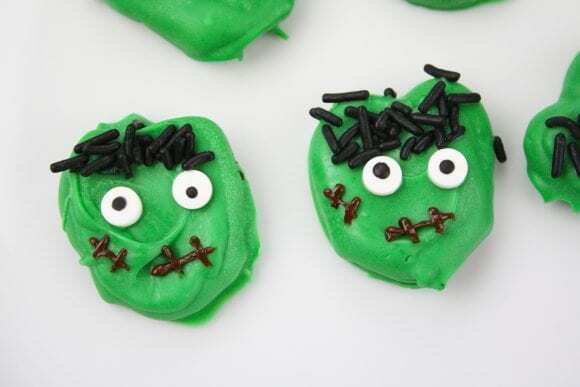 Add ¼ to ½ teaspoon coconut oil to give the candy a smooth consistency. Line a baking sheet with parchment or wax paper. Dip the pretzels into the green candy melts, using a fork, lift the pretzel from the melted candy coating and gently tap off excess coating. Place on the baking sheet and chill. 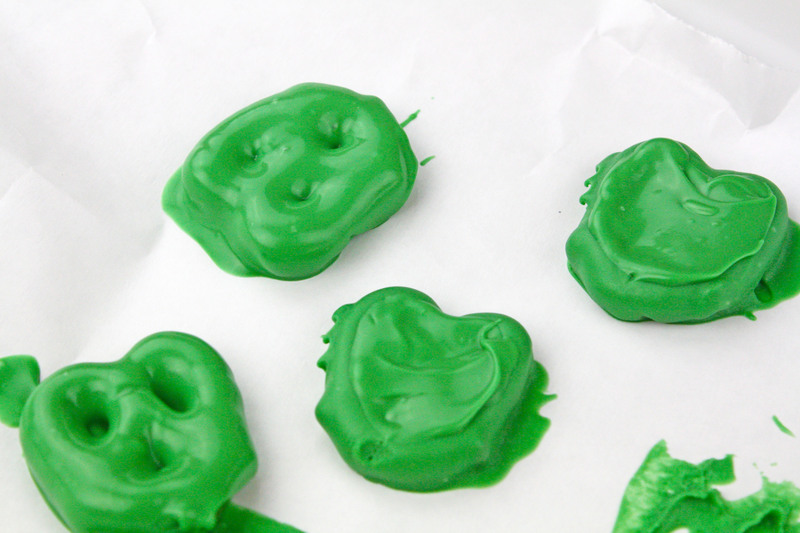 Once the candy coating has chilled, scoop a small amount of green candy coating onto the cold pretzel. 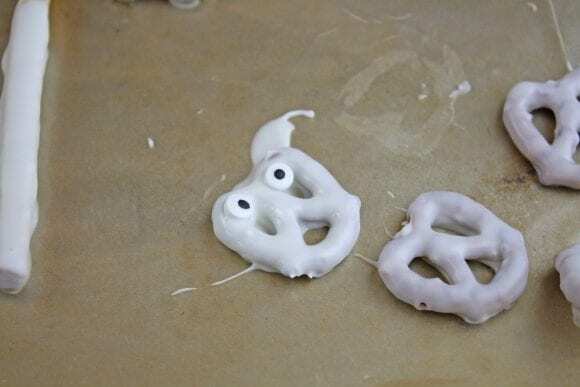 Spread the coating around so that you have covered the majority of the holes in the pretzel twist. 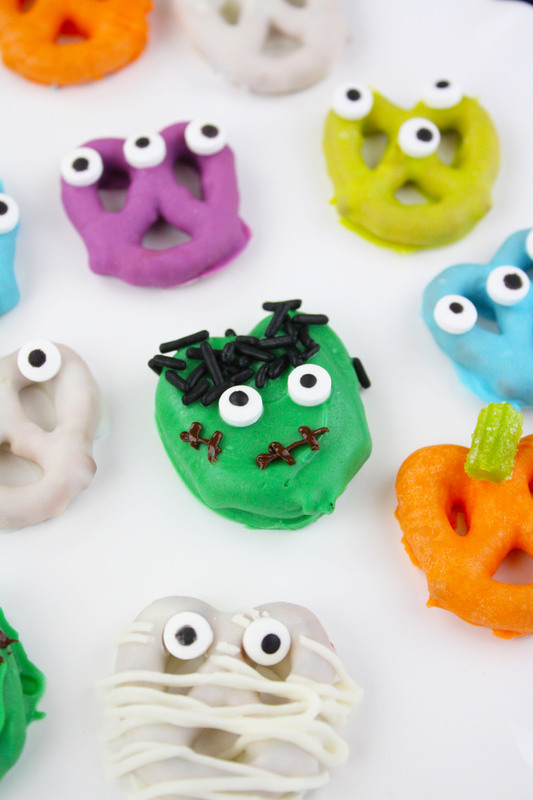 Before placing the pretzels in the fridge to chill, add two candy eyes and some black jimmie sprinkles for the hair. Place in fridge to chill. Next, melt a couple of tablespoons of chocolate chips in the microwave. Put melted chocolate in a Ziploc baggie and cut off the a tiny corner of bag. Squeeze the chocolate through the tip to draw the mouth and stitches. Chill in fridge before serving. Melt the orange candy melts in the microwave. Add ¼ teaspoon coconut oil to the melted candy. 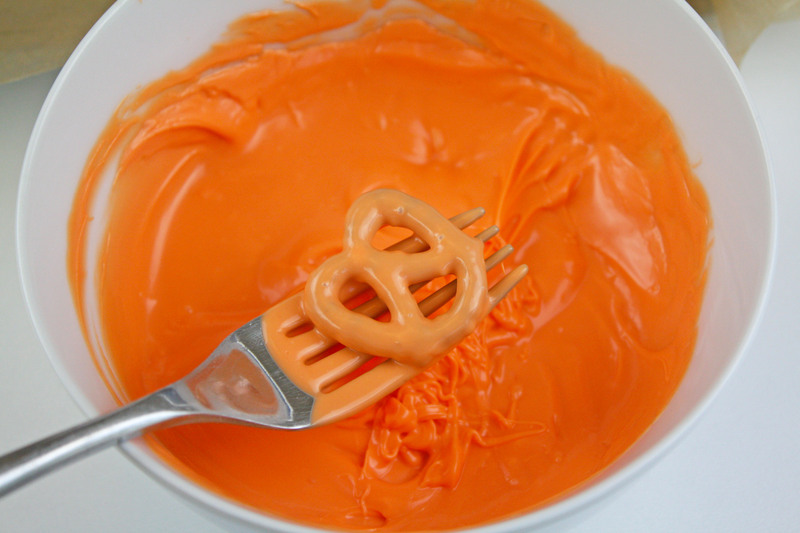 Dip the pretzels into the melted orange candy and lift up with a fork. Tap off excess coating and place on a parchment lined baking sheet. Chill. Repeat the dipping a second time and place on baking sheet. Add a small sour punch stem to each pumpkin, place in fridge to chill. Melt the white candy melts in the microwave. Add ¼ teaspoon coconut oil to the melted candy. Dip the pretzels into the white candy and tap off excess coating. Place on parchment lined baking sheet and chill. Repeat the dipping and chill. Place some of the white melted candy into a ziploc baggie and cut off the tip. 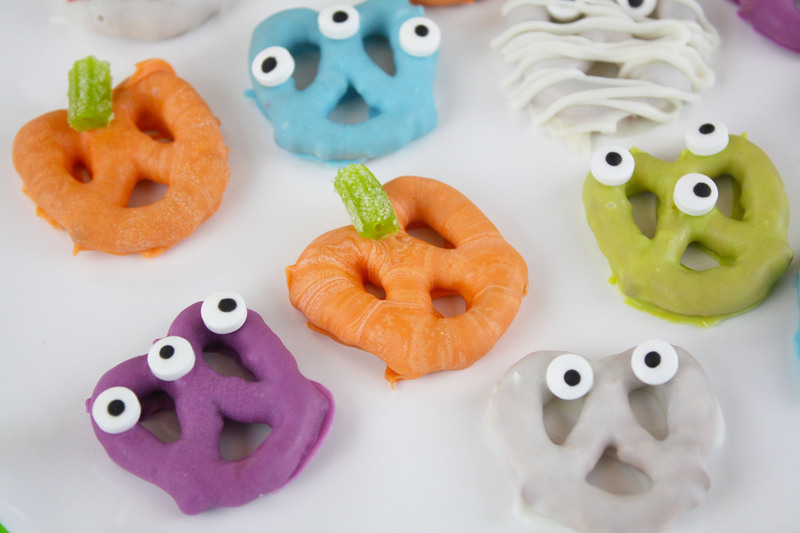 Make lines across the pretzel in a back and forth motion. 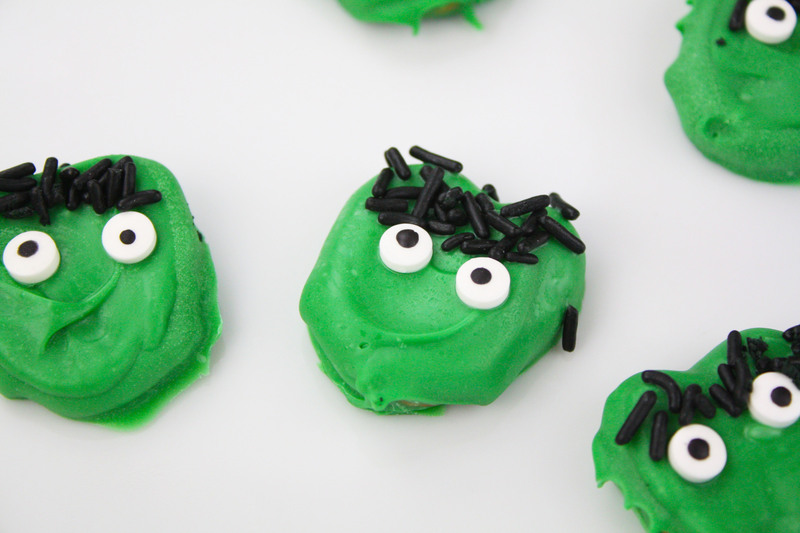 Add the candy eyes and chill until ready to serve. Melt various colors of candy melts and add ¼ teaspoon coconut oil. Dip the pretzels into the melted candy and tap off excess coating. Place on a parchment lined baking sheet and chill. Repeat dipping for more vibrant colors. On the last dipping add the candy eyes and chill until you are ready to serve. 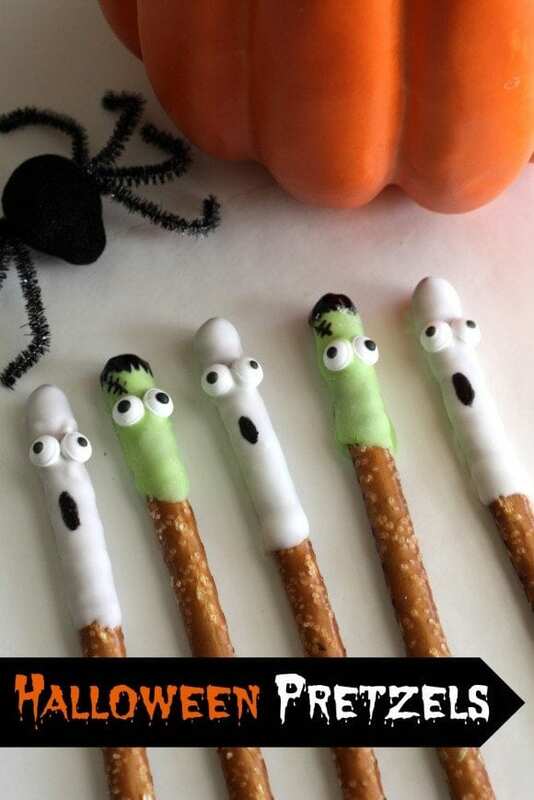 I love how adorable and easy these are to make!